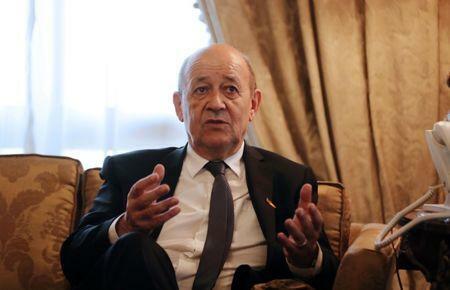 PARIS (Reuters) - Iran's declaration that it could increase its uranium enrichment capacity if a nuclear deal with world powers falls apart risks sailing close to the "red line", France's foreign minister said on Wednesday. Supreme Leader Ayatollah Khamenei said on Monday he had ordered preparations to increase uranium enrichment capacity if the nuclear agreement collapsed after the United States withdrew from the deal last month. It also informed the U.N. nuclear watchdog of "tentative" plans to produce the feedstock for centrifuges, which are the machines that enrich uranium. "This initiative is unwelcome. It shows a sort of irritation," Jean-Yves Le Drian told Europe 1 radio. "It is always dangerous to flirt with the red lines, but the initiative taken ... remains totally within the framework of the Vienna (nuclear) deal." European powers are scrambling to save the deal - under which Iran curbed its nuclear program in return for a lifting of international sanctions - as they regard it as the best chance to stop Tehran developing an atomic bomb. "If they go to a higher level then yes the agreement would be violated, but they need to realize that if they do then they will expose themselves to new sanctions and the Europeans will not remain passive." Le Drian, who said Iran was for now still abiding by its commitments, was speaking a day after Israel's leader urged France to turn its attention to tackling Iran's "regional aggression", saying he no longer needed to convince Paris to quit a 2015 nuclear deal between various world powers with Tehran as economic pressure would kill it anyway.